They can be used to purchase any show in the Festival and are the easy and quick option for Christmas. Do you know who loves fringe? Your mates! And especially your lady mates! Hanging out at Fringe with your besties is total squad goals. Give your BFFs a Fringe Gift Voucher so you can gather the gals for a night of giggles, gasps and new memories. Be dazzled by Aurora Galore and the Glamorous Weirdos with its fire, circus and burlesque or be thrilled by Le Aerial’s spectacular display of aerial grace and beauty. If you and your gal pals are feeling extra adventurous, kick it up a notch with the high-octane spectacle of Fuego Carnal. No one is ever too young for a Fringe Binge! 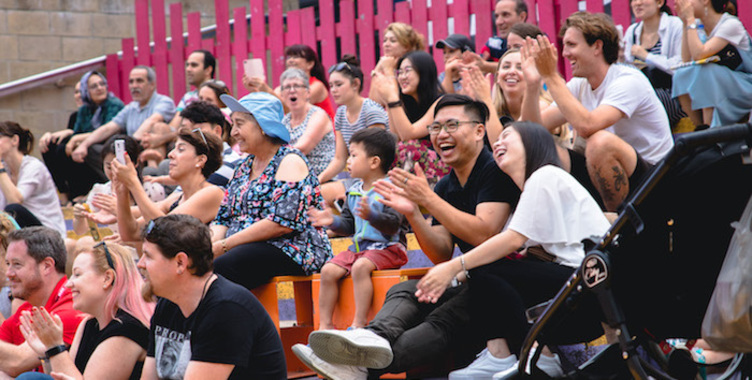 FRINGE WORLD 2019 boasts a two week overlap with the school holidays so there are even more boredom busters than ever before. A Gift Voucher could be your child’s or grandchild’s unforgettable first introduction to amazing shows and entertainment. The Woodside Pleasure Garden is the place to be for friendly entertainment set to delight with Mr Gorksi and Troll a couple of must see shows. Stringy Thingy is sure to wow with its mix of comedy and magic. Fringe is for the young and young at heart so treat your Grandparents to incredible entertainment that will make them feel like they’re 20 all over again! Grannies with a cheeky streak will love Another Night at the Musicals, get their toes tapping with at the country meets jazz The Western Swing Hour with Lucky Oceans and Jessie Gordon or tickle their funny bone with witty cabaret Comma Sutra. For your mates who are new to Fringe, treat them to some mind-blowing experiences and they will be your bestie forever! Gift Vouchers give them the freedom to choose what they want to see and when – you never know, they might invite you along for more Fringe fun. Win-win! Some of the best places for them to start is crowd pleaser Comedy Hypnotist Matt Hale’s Feelgood Factory, Indigenous dance sensation Djuki Mala and acrobatic adventure Railed. What better way to cap off a week at the office than heading to a Fringe show or two to unwind? Your colleagues will be shouting you morning coffees for a week if you give them a Gift Voucher. Enjoy some workmate hangs at the hilarious Josh Glanc: Glance For Having Me, the dazzling Matt Tarrant: More Unsolved or a show based on a local legend with Tony Galati the Musical.